One year on… it seems like only yesterday. I’m currently working in Sydney at a PR agency, living in Elizabeth Bay and every day waking up dreaming of Brazil. The hardest thing about travelling had to have been coming back home and learning to adapt back to a life I had previously been used to, but taking all of the things I had learnt during my trip and incorporating them somehow. It’s still difficult one year on… but life is always what you make of it. So I’m currently working to save up and do another huge travel experience again in the next few years. If you want to come and tag along, let me know! Or make a suggestion of where to go even! Thanks for reading my experiences and I look forward to sharing more with you all soon. Lots of love, Adam – the Brazilianaire. I had planned with my sister for some time to arrive back in Australia early and surprise the rest of my family. Mostly this was just to avoid a scene at the airport with my mother (she’s a little emotionally unpredictable at times). Two weeks before I’m scheduled to return and I get a call from my mother, who says she has a feeling I am planning to come back early (how did she work that out?). And she emphatically said that she would be VERY disappointed as she wanted to meet me at the airport. So much for avoiding a public confrontation. I had already booked my secret flight and organised it all, so there was no changing plans now. However, my sister came up with the great idea that Mum and Dad were down in Adelaide the same weekend and that I could then go and meet them at the airport instead of them meeting me. I figured it would still pay off as there’d be less of a crowd at the domestic terminal than the international for me to be embarrassed in front of. My mate Rafael came to pick me up at the airport and then I went over to my sister’s place and hung out slowly acclimatising back to Oz! A few days later and it was time to meet Mum and Dad at the domestic terminal. Mum came through the terminal doors, down the escalators, saw me and then screamed. As I had anticipated, everyone in the terminal looked up worried about a possible terrorist attack, only to find the happy reunion of a mother and father with their travelling son. But I was back in Australia and certainly it was going to be good to acclimatise back into the Australian way of life. May and the Brazilianaire catch up! The city state of Singapore was very welcoming. 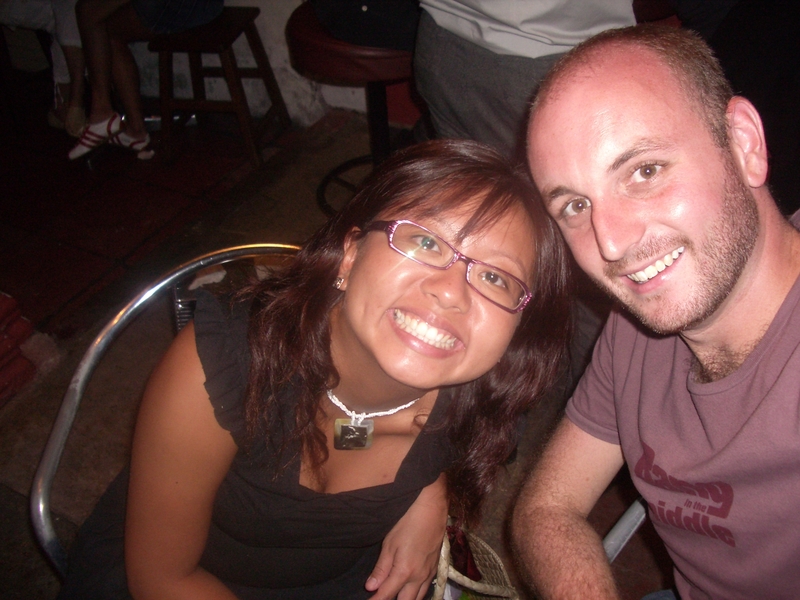 I caught up with my friend May who studied with me at the University of Newcastle. She looked after me very well and helped to find me a place to stay with her American friends Don and Todd. May took a day off and decided to hang out and catch up. Faced with the decision of what to do, she made the suggestion of going to the beach. The beach? In Singapore? She had to be kidding right? All in all I had a great time in Singapore, but I was itching to get home – only a few days at the most! So I thanked May, packed my bags for the last time and jumped on a plane for that last leg home…. 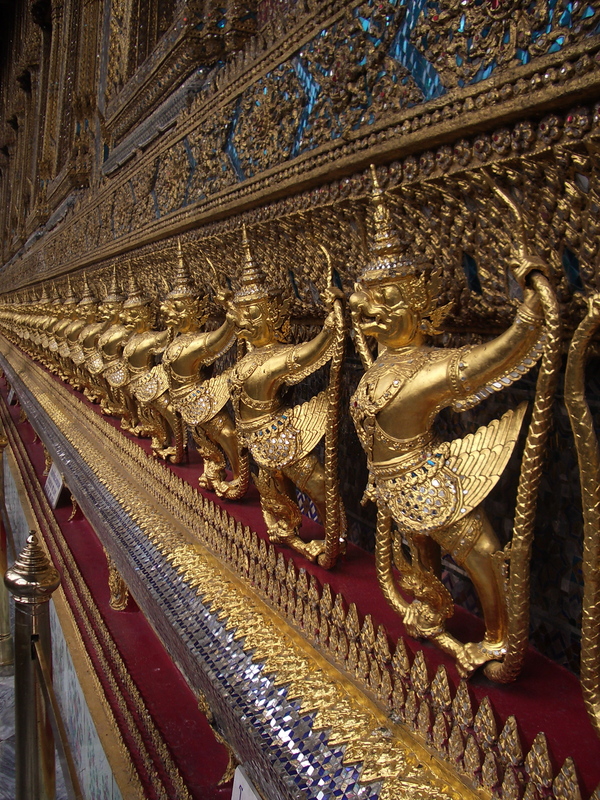 Bangkok, Thailand… I was getting so close to home now, and beginning to feel the effects of traveling without stopping. I decided to take it easy in Bangkok and just hang around at the hotel watching movies, ordering great Thai food and spending the day wandering around the temples, streets and markets of Bangkok. I think I missed every cultural experience in the city, choosing instead to stick to a habitual routine of frappes at the Coffee Society to start the day and then wandering through the hordes of lady boys and tourists haggling a deal to get back to my hotel for a bit of R’n’R. With close to a year on the road, I was fast approaching the end of my journey, and my energy levels were starting to wane. The break in Bangkok was good for me – even though it meant that I never really got to see the true colours of Thailand’s cultures. Ah, but I imagine it won’t be long before I am back in Bangkok to further explore the country. Now I had heard that clothing was very cheap in Thailand, so I began thinking of my ultimate move back into the corporate world and ventured out looking for a good tailor. After visiting numerous shops I finally settled on one that was not the lowest in price, but appeared to have a a good price for a good quality suit. My hostel in Hong Kong was like a military camp hidden in the mountain highlands. No joke! I was beginning to wonder if it was the right decision to go there at all when I arrived after a very long bus trip that seemed to go further and further away from the city where I wanted to be. There were curfews, large 36-bed dorm rooms, gates that locked after midnight and only a few scheduled bus runs into the city each day, which you had to pre-book the day before. But then again, there was a great group of people staying there and it made all the difference. We even had a communal BBQ one night which I’m sure broke every health regulation in the country. It was only after I left Hong Kong that I came to realise that it was the birth-place of the avian flu. So here I was woofing into the chicken dishes and lapping up the asian cuisine where I could. Oh well, you can’t live life with too much fear. Have you ever had a birthday where you just wish it had never happened? 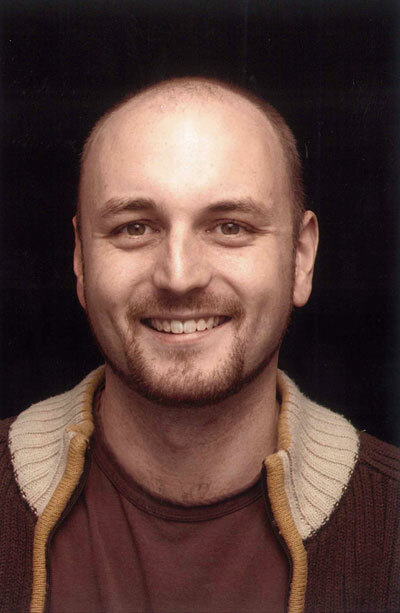 Some of you are probably thinking perhaps your 30th birthday… Well I wasn’t a fan of my 28th birthday. It happened in Madrid, Spain, an incredible city and the day should have been anything BUT ordinary. The day was determined to not go my way, or allow me to go with it. 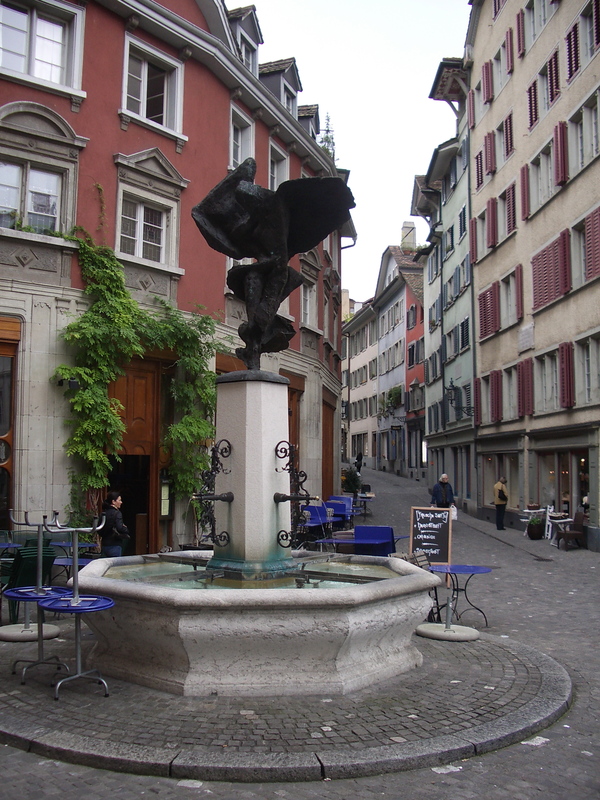 So when I came into Zurich two days later, I decided to do something about it. 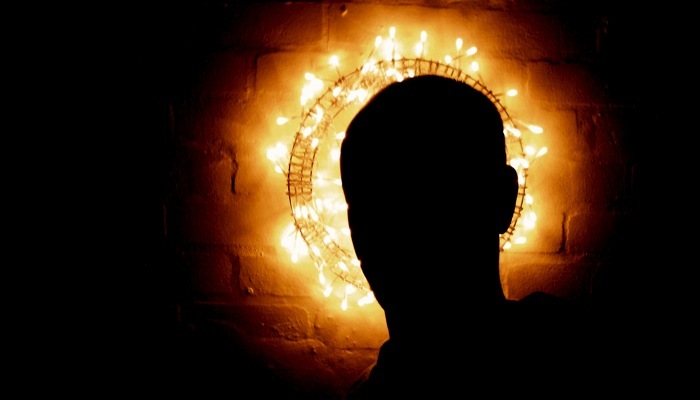 No one knew me in Switzerland, and I certainly didn’t know anyone there – so I reinvented my birthday. No longer would I be shackled down to the day of my birth! I made some friends at the hostel who were only too happy to help me pass my renovated birthday evening by going out for dinner, drinks and a bit of a dance. I even managed to get to know a few of the locals before the night was through, and everyone was happy to join in the celebrations… The night was perfect and I woke the next morn… afternoon full of memories and happiness. My advice to those with birthday blues – don’t let a simple thing like a date get in the way of you having a good time – make the switch. I highly recommend rebirthing at least once every decade! 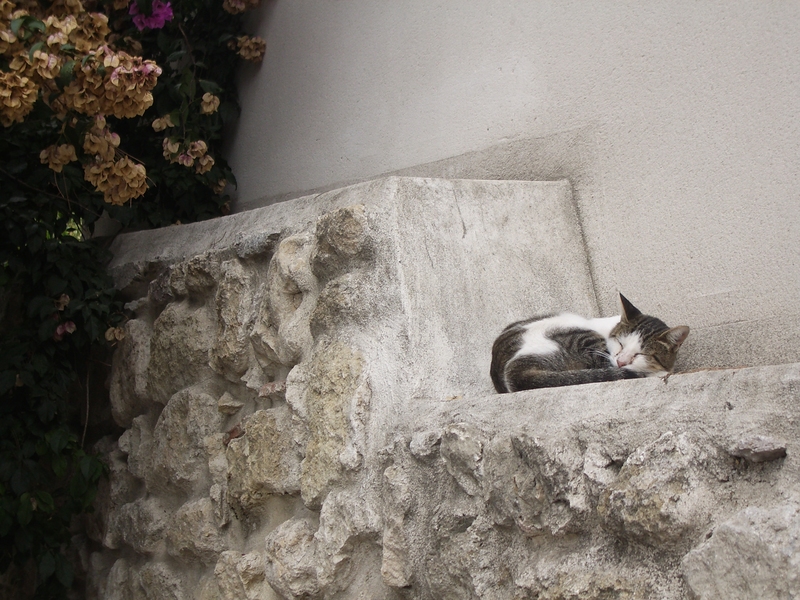 Lisboa is a sleepy kind of town at the best of times… definitely my style! It was my last night at the Lisbon Lounge Hostel, a great modern backpacker hostel at the foot of Lisboa’s hilly terrain. I had made some great friends there, among whom were Vicky and Nicky. These delightfully friendly British girls, taking a break from their studies, offered to share a meal with me which they were happy to say had more than seven different ingredients (A huge undertaking for most budget-conscious backpackers.) I was very interested to see that they had included all four of the pre-packed “Four Cheeses” pasta mix as separate ingredients and wondered if they were taking a break from studying marketing with a major in Fiction…. So to top it off, the next day I invited the two girls and a few other stragglers to dinner at my new hostel. My mission was to include eight different ingredients in the pasta sauce. Tomatoes, onions, cheese, broccolli and carrots were the base of it all and I claimed basil, oregano and salt to be my final three ingredients. Between the two nights, it certainly lifted the bar of culinary success that I had experienced at any backpackers previously. And speaking of food – the custard tarts in Portugal are the best! 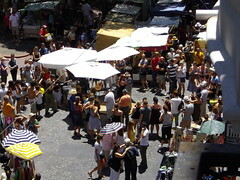 The ever popular portuguese tart is best sampled in the neighbouring town of Belem. There is a cafe there which has been serving them hot and fresh for a number of years and claims to have the best custard tarts in all of Portugal. After tasting about three, I had to agree! So if you’re ever in Lisboa be sure to check it out! And just so you know, Lisbon is the English spelling for Lisboa. I had to visit Portugal to see the country with its history intertwined so closely with Brazil. 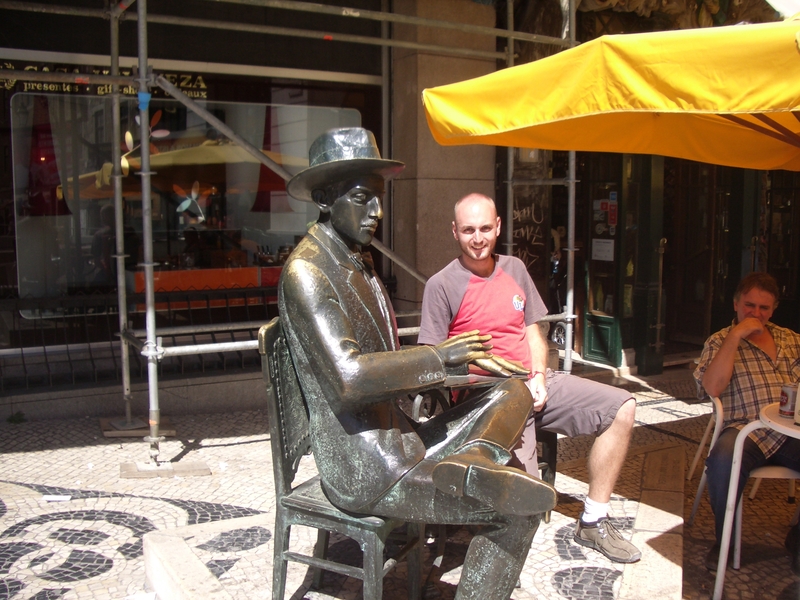 And I had a particular fascination with Lisboa because of the poetry of Fernando Pessoa. If you haven’t read any of his works, then at least read the one I have included below. His originals are in portuguese, but this english version does this particular poem justice! If I thought that Paris was a great city to explore unplanned on foot, then Lisboa is even more so. Wandering around from ruined cathedrals to city forts perched on the hill, its a historic city with rustic views around every corner without the faster pace of Paris. For a stimulating read, try Fernando Pessoa’s semi-autobiography, “The Book of Disquiet”. If it doesn’t change your views on a number of topics, then it will at the very least stimulate you into thinking about them. I call them the Infamous Five because if Enid Blyton were there, I’m sure she would have done the same. But to qualify for one of her stories, there needs to be mystery, intrigue and adventures. Now, if you have ever seen some of the Scooby-Doo series, or some classic horror schlock, then you’ll probably know exactly what I mean when I say the decor was ‘Haunted Freakshow Theme Park’. Passing giant painted sculptures, posters for freak shows, we entered through the darkened corridor. The music was on, the lights were dim and the place was empty! Half-expecting to meet a “Jason” or a “Freddy”, we sat down in the rather odd chain chairs that were hanging from the ceiling. It turns out, the owners were watching – you guessed it – football! So after a few minutes of trying to make the ‘vibe’ of the place work for us, we decided to head on back to town on foot and in defeat. Enid Blyton would have loved that bar if they served treacle, and so it came to pass that I dubbed the girls the Infamous Five. Barcelona is famous for its Summer Olympics in 1992, Joan Miro’s enthralling artwork and of course Gaudi’s unique architecture. It’s quite something to visit the La Familia Sagrada, Gaudi’s Stone Cathedral, and see the work as it is progressing. It began in 1892 and will take around 200 years to build. Looking closely at his design, you wonder how he was able to come up with such complex patterns and structures without the aid of computers. But the astounding thing about Gaudi, is the number of buildings and designs that he came up with throughout his life. There is a local story that Gaudi was so impressed with his own work that one day he was run over and killed by a tram while gawking at his masterpiece. 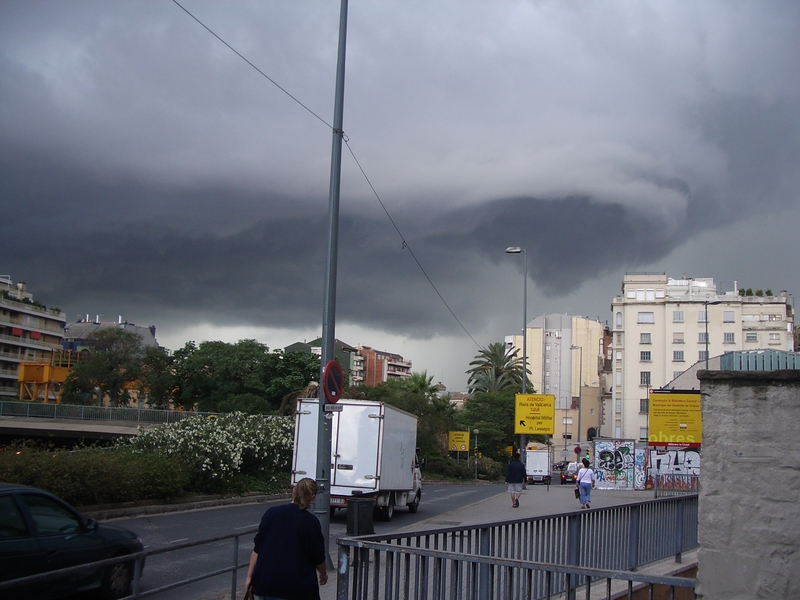 And one for the weird file… There were three tornadoes in Barcelona in 24 hours. I managed to see one of them starting to form and the other two Aussie guys happened to get off their plane just as the other two formed behind them near the airport. 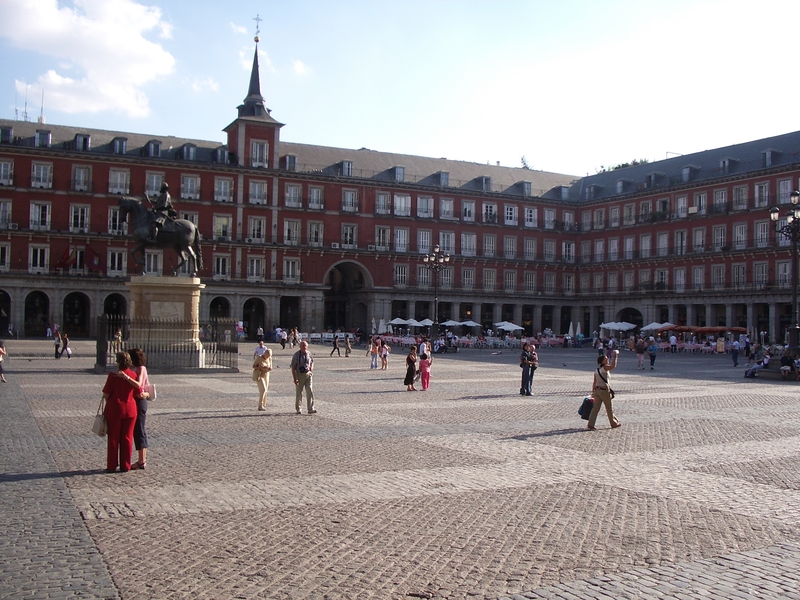 Arriving in Madrid in the early afternoon, I jumped off the metro to find its streets deserted. There were more stray dogs than people, and more gusts of gentle wind than cars. Wisps of cotton sheets and clothing hung from open balcony windows and furled lazily in the breeze – their flapping easily breaking the distant hum of traffic. Unperturbed, I walked around until I found my hostel, checked in and then realised I was intruding on someone’s siesta time. I now understood the lack of activity outside, and quickly curled up for a power-nap of my own. I awoke again after dark and headed out on the streets to find the place packed with metropolitan easy-going Spaniards. They weren’t afraid to pass on a smile or help if you needed directions. With remembrances of South America, the Latin essence of Madrid trickled through my veins and recharged my weary spirit. These Madridians sure knew how to party… Staying out on the streets all through the night, and I think there were probably more people in the plazas at 3am than there were at 1pm. The street entertainment was well worth staying out for, and one of the best moments had to have been at about midnight mid-week in Chueca. It was the steady beat of deep drums that drew me to the plaza, in time to see four guys bashing out a complicated rhythm on a variety of drums. Their leader was a short guy with really long hair that would hang down in front of his face as he concentrated and gyrated his ‘mop’ to the syncopated beat. Adding to the hypnotic effect of these gyspy drummers, were a number of fire-twirlers who were VERY good at their craft. Wielding large solid implements they twirled with such ferocity and velocity that I was starting to wonder if any insurance company would be in a position to offer them public liability. Just one badly timed flick of the wrist and those fireballs would have been sent into a very large number of people. In less than a week, I found myself headed for the coast and Barcelona. I met two other Aussies on the midnight bus on the way over and we somehow managed to get off at the wrong terminal in Barcelona. So we made up for it by eating breakfast at the ARS cafeteria – I had to steal a few of their napkins just for laughs! We parted ways and I arrived in the main tourist centre of Barcelona – La Rambla. 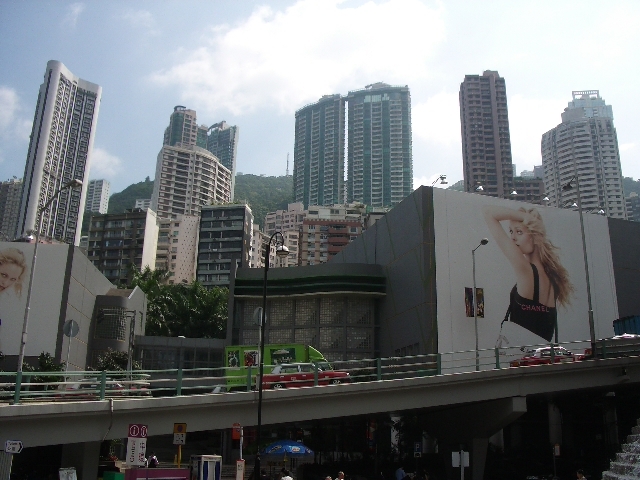 It’s a long stretch of road that is seperated by a large pedestrian walkway in the middle. 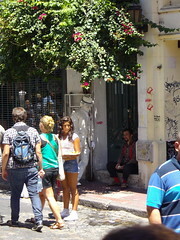 As to be expected, there are many buskers, street performers, stalls, gimmicks and tourist traps. The most prevalent type of street performer are the ‘statues’ – you know those people that dress up and then hold themselves dead still for 5-10 minutes at a time. La Ramblas has to be the world’s best collection of ‘statue’ buskers. From headless Charlie Chaplins to a white marble statue on the ‘throne-room’ (complete with royal toilet paper and a good book) to more modern characters like Mr & Mrs Smith (unfortunately it wasn’t actually Brad or Angelina). But don’t even think about taking a photo without throwing some change into their bucket! The public ridicule alone could leave a tourist bedridden for days.